The Playground is a young actor’s conservatory: a place where actors are immersed in the craft of Television and Film Acting. Young people of all ages look forward to coming here and taking part in our carefully designed curriculum, a program that has been personally developed by Gary Spatz. Drawing on 25 years of experience with young actors, Gary has crafted a unique training program that is focused on preparing your child for Film and Television acting – and auditioning! Children who attend The Playground will improve not just in their acting skills but in other areas of life. Our students often experience; better speaking ability, better listening skills, improved reading comprehension, improved school performance and increased confidence! This programs is available for kids ages 6 to 12 at all experience levels. Gary Spatz and his staff of professional acting teachers nurture each student’s creativity to help them excel at on-camera work. The staff is dedicated to helping young actors develop a personal technique for television and film. Whether you are preparing your child for a career in acting or just for success in life, The Playground is a great place to learn. Acting classes provide lifelong benefits! Many children watch their hero on television and film and think how they would love to be an actor. While the child may not end up on the big screen, at least they can learn the life skill of acting. Young Actors’ Conservatory Acting Classes provide practical benefits for the child throughout the course of their lives. Hear why you should join us at the Young Actors’ Conservatory from the students. Young Actors’ Conservatory Acting Classes can help your child connect with their right-sided creative brain. 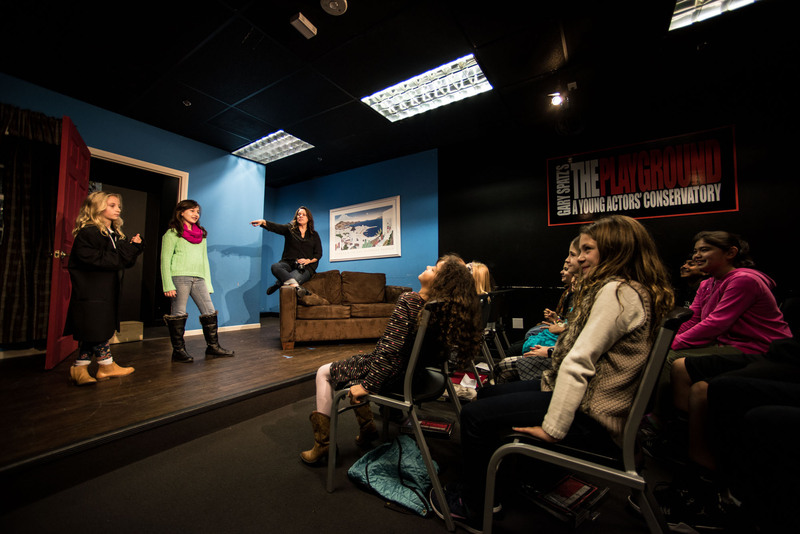 Acting is an art, and as your child attends acting class, the child will use and develop their creative abilities. Gary Spatz’s The Playground encourages each child to creatively engage with fellow actors in delivering their performance. We challenge each child to be curious, explore different arrangements, become playful, spontaneous, emotional, funny, passionate, grow and learn. As the child learns to exercise their creative muscle, its effects will start to permeate other areas of their life. The Playground acting classes a child gains confidence in their ability to perform by the repeated process of learning to act in front of a camera. With our acting classes, the child learns how to tell a story to an audience. At The Playground, we do not just want your child to keep an audience’s attention; we want your child to have the audience on the edges of their seats waiting to hear that next word. Public speaking is the number one fear in the minds of many people. Acting classes is a wonderful way to build self confidence and remove this fear. Through acting exercises and camera feedback, The Playground students become quite used to speaking in front of each other. As they become more comfortable, their confidence increases as well. Through character study and development studies, our students feel more confident about public speaking as it is their characters who are speaking. Additionally acting focuses on vocal projection, articulation, and timing. We believe self confidence is an attribute that will allow the child be better prepared for delivering oral reports, auditioning, job interviews, and presentations. A child, when they are improvising, must focus on being completely in the moment to bring life to a character. The Playground acting classes can help your child connect with their emotions; to bring their emotions out from hiding, and to face them. By acting out the lives of others, the child gains a deeper understanding of others as well as learns about themselves. An acting class can teach your child how to use their body, emotions, and empathy to communicate effectively. At The Playground we encourage the students to explore what is motivating their characters to do the things they are doing. Getting in touch with their characters’ thoughts and feelings often helps the child become more aware of their own thoughts and feelings. Understanding what motivates different characters helps people better understand people. This awareness allows actors to empathize with others and communicate effectively. The ability to empathize and communicate effectively will help the child in their personal and professional relationships long after the cameras stop rolling. Another important benefit gained through acting is the ability to work as a team. As a team member you are rehearsing and performing with other members of the team. At The Playground, students learn to take direction, lead, support, and trust themselves as well as others. Teamwork and cooperating with other students and coaches is critical to acting. Through the acting experience the child learns group dynamics and the importance of leadership and supporting roles. Each child learns the show does not exist without everyone working together as a team. Many of Gary Spatz’s roster of former coaching students felt teamwork and the networking opportunities afforded by the acting classes were very beneficial to not just their acting careers but many of the endeavors undertaking in their life.